Weirdly enough, today's task is possibly my favourite kind of decluttering. It's easy, it's not attached to any sentimental emotions, and it's strangely rewarding. Well, at least to me. Today's task is to clean out your pantry and food cupboards. 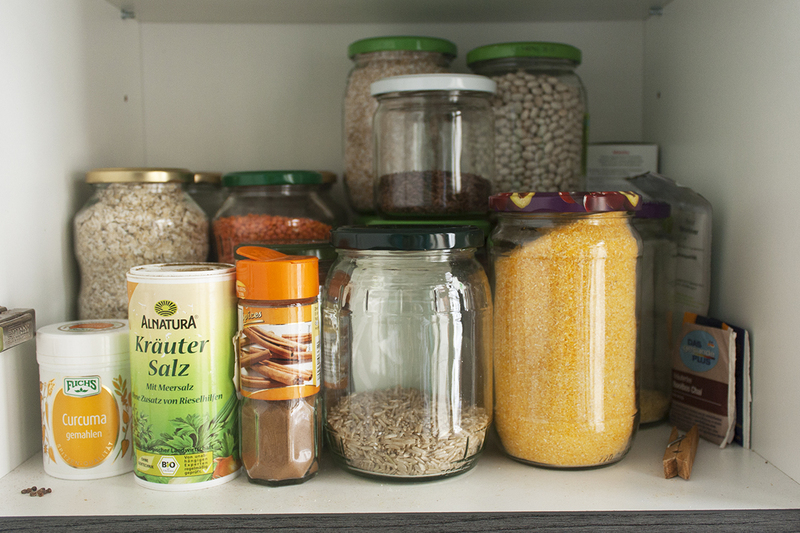 If you don't have a separate pantry, declutter whatever shelves you keep your food in. Ever opened your pantry door and had a moth fluttering towards you? Or rushed out to buy more canned tomatoes you needed for dinner, only to find two more cans buried at the back of the cupboard some time later? Yeah. Time to cull that mess. no more lost, forgotten, outdated items! Is my pantry overwhelmingly full? Do I know which inventories are where? Has anything passed its shelf life? Is anything infested with pantry moths? Are there any products I don't intend to use within the next three months? Which are my shopping staples? Or is everything just randomly scattered and stuffed into the shelves? 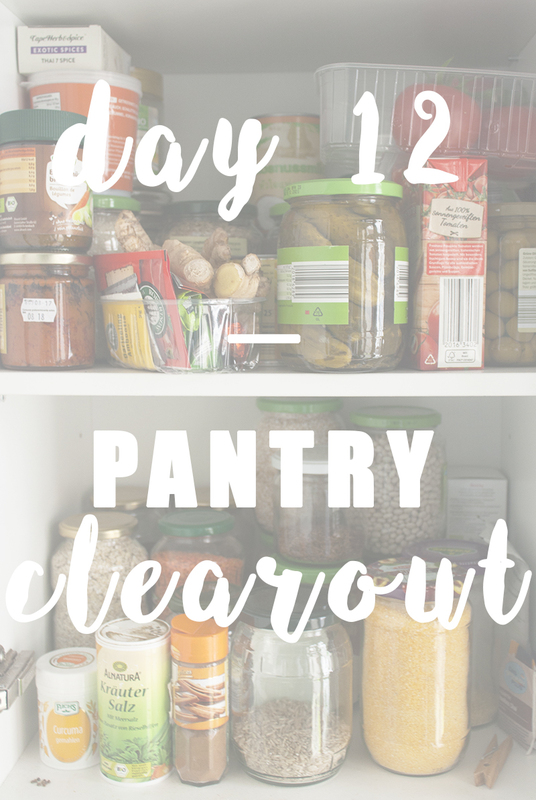 If purging your entire pantry is too overwhelming to do in one day, do one shelf at a time instead! Take everything out of your pantry, or the cabinet or shelves you use as a pantry. Kitchen counters and tables work well for temporarily storing and organizing all your inventories. Sort everything according to categories (baking stuff, savoury cans, fruit cans, pasta, spices, snacks etc.) to get a better overview of what you have. Clean all the crumbs and spills of your shelves. Which are your staple food and should therefore be the easiest to reach? Anything you need to stock up on? Any canned goods you haven't touched in ages and are probably never going to eat? Do you really need to have five boxes of cereal in stock? e) you won't likely eat or use until they expire and get wasted. Group like items together in a way that is logical to you. So baking ingredients in one group, canned vegetables in another, canned fruits in another, legumes, cereal, rice, pasta, spices, and so on. Store your frequently used staples should be stored between chest and eye level for easy access. Move everything else up top or at floor level. Make a list of all your pantry staples, and hang it on the pantry or cupboard door. Go through your list once a week to see what you need to stock up on. Use pull-out caddies, baskets or Lazy Susans for easy access and storage. Adjusting the heights of the cabinet shelves to best accommodate those items you wish to store with the least amount of wasted space! Donate any food that is not open and not expired to a local food pantry (or similar charity). Or just ask your friends or neighbours if they would like to have it. Give away any open items that are still safe to eat to friends or roommates that might still like to use them up. You could also have a "pantry party" with neighbours or friends where each person brings several items from their pantry that they don't use or like, so each of you can pick the items you like from your collection. Toss any products that are vastly past their expiration date or show signs of unwanted visitors such as pantry moths. b) arrange each type of item by expiration date with the oldest item in each category at the front and the newest item (or the item with the most distant expiration date) at the back. And we're done! Pat yourself on the back, you deserve it. For tonight I suggest you go grocery shopping (AFTER you've evaluated your pantry 😉), and get yourself something healthy like a green smoothie – or ingredients to make a green smoothie at home. See you tomorrow for our next decluttering session!